Alaska Sheep Hunting is one of the most thrilling experiences a big game hunter can have. These hunts can be extremely challenging for the hunter but the rewards are well worth it. 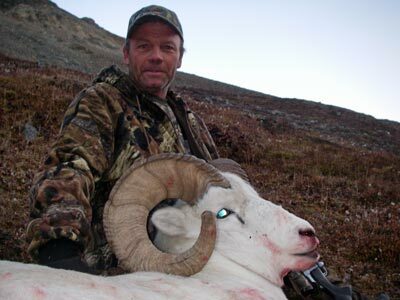 Top Gun Treks are the sheep hunting guides with the knowledge and experience to take you into Alaska’s backcountry. You will be able to hunt areas with large populations of Dall Sheep and other big game. Our Alaska sheep hunting guides will take you to areas with limited hunter access which gives our hunters the best opportunity to take the ram of a life time. You’ll never forget an Alaskan Dall sheep hunt. You’ll have pictures, memories, and a trophy of a life time. These animals are most often found living and browsing in higher elevations above the brush line and along the slopes of the mountains. On our hunts, we spend much of our time hiking out from camp, glassing and watching mountainsides and ridges. Once we judge a “shooter” we put the stalk on him and close in for the shot. We are often able to sneak within 200 yards or less to these magnificent animals. Sheep hunting is physically and mentally challenging but well worth the time and effort. 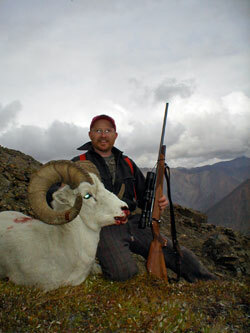 Alaska Dall Sheep hunting is one of the most challenging and rewarding hunts you can can experience. 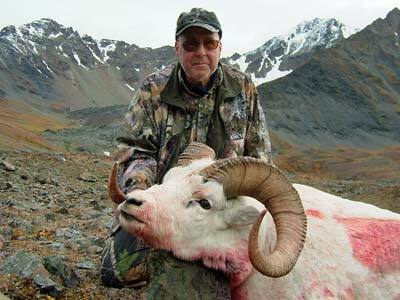 Bob Jewett, registered Alaska hunting guide has been sheep hunting Alaska for over 36 years in almost every major range in Alaska. The amazing country you will see while sheep hunting in Alaska will be fixed in your memory for life. Majestic mountains, pristine rivers, and a large game population are constantly in view and keep the hunt exciting. We hunt conduct our fall sheep hunts in the Alaska range, which are noted for high rugged snow capped peaks, glaciers, and vast lush valleys and landscapes. The beauty of this land is hard to imagine unless you experience it, and it is always a privilege for us to share it with our hunters. Our hunters are constantly amazed at where sheep hang out along these steep mountain ridges. They are one of natures truly amazing creatures and they survive in some of the most harsh climates on earth. As a bonus Dall sheep meat is renown for being one of the best tasting wild game meats in the world. Our Alaska sheep hunting guides spend many hours scouting the areas that we hunt long before you arrive in order to find the best places hunt. When we locate groups of legal rams we do our best to place our hunters as close as possible to the animals, where we set up spike camps from which to hunt. 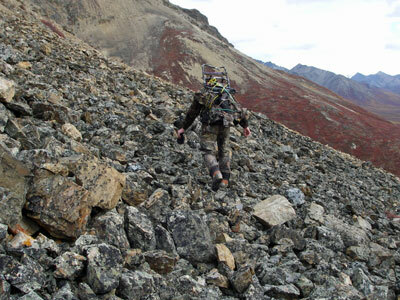 Alaska sheep hunting requires good physical conditioning and hunters must be able to walk several miles a day and should expect to do some moderate uphill hiking. Some considerations should be made when choosing gear and especially boots for these hunts. We will be glad to discuss this with you to assure you have the right stuff. 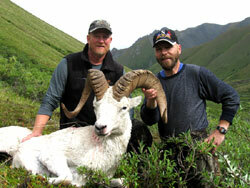 Our Alaska sheep hunitng guides have years of experience sucessfully taking these trophy animals. When you want a guide to assist you in your next hunt, go with the experience and success you can trust. Top Gun Treks – The Alaska sheep hunting guides that can take you there and give you the chance to bag your Alaskan Dall Sheep.